We have seen a Purple Cow, and she has area! We were studying WI products and agriculture, and WI has a substantial dairy industry. I decided to combine the study of dairying with the math study of area and graphing. Prior to the math lesson, we read the poem "The Purple Cow" by Burgess to put us in the mood for a purple cow. 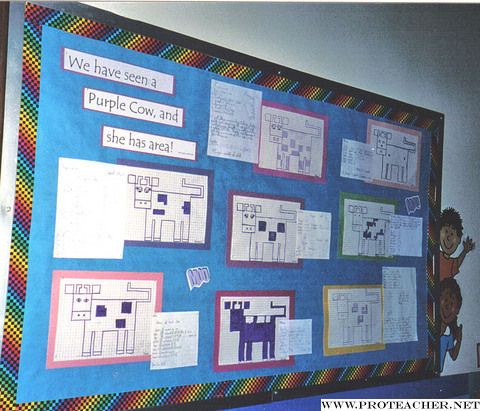 Each student had to follow a specific graphing sequence to make their cow on graph paper with purple marker. The students also had to have a minimum of three spots on their cow. Once the cows were made, the students then had to compute the area of the cow on separate lined paper, recording each of the sections of the cow I.e. her tail, her ears, her muzzle, her spots, and so on. How they divided up the area was left up to the students. The areas of the parts of the cow then had to be added together to get the total area of the purple cow. When the math was done the students, the students enjoyed a purple cow drink made from WI ice cream and grape juice.